As the title says, I am curious about your stereo system, or plans for your stereo system..... sopost them up ! I will start, my system currently consists of my I-phone 7plus feeding to a I-Simple Musicstream Bluetooth receiver, feeding to a MB Quart Powersport 320 watt amp feeding to factory 5x7 speakers front and rear. 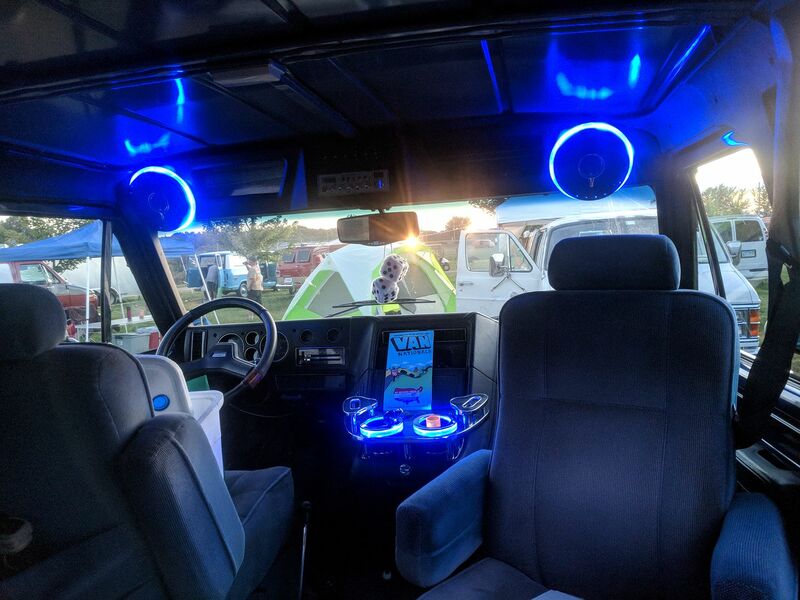 Later on I will upgrade the speakers to some Kicker 6x9s in the factory locations (front doors and rear pillars) as well as 6x9s in the leading edge of the bed and 6.5s above the driver/passenger seats. At that point I will also add better amps, and a single 12” sub in a sealed box in the leading edge of the bed too. Giving me a total of eight co-axial speakers and a sub, I will Ben shooting for a total of about 1500 watts total system power. That sounds it for my current stereo plans, what do you have built or in mind ? I am going to be doing the stereo in mine this summer. While I have too many ideas to try to put into a list quickly here. The biggest thing I can emphasize is: SOUND DEADENING! SOUND DEADENING! SOUND DEADENING! Vans (especially if they started out as cargo vans) are like tin cans inside when it comes to acoustics. You don't necessarily need to cover the whole thing with dynamat, there are many different ways to go about it, but nothing will kill an excellent stereo system's quality faster than resonance and rattles. I'll post my to-do list a little later. Very true on the sound deadening , and if I was starting with a empty can, I would be doing MUCH more deadening than I am ! If starting with a cargo, I strongly suggest “painting “ the interior with Lizard Skin . This stuff will make a empty cargo dang near Cadillac quiet inside ! If you need to go “cheap” even spray can truck bed liner will help , A LOT over nothing at all, and it only runs ABOUT $10 a can, depending on where you get it. I priced out doing both the sound and thermal Lizard Skin in my van and it would be well over $1200. The recommended stuff from sound deadener showdown was even more. While I originally had ambitions to make this as quiet inside as the Lexus that I daily drive, Due to the costs, I've since decided to revise the plan quite a bit focusing on an overall improvement in thermal insulation, and sound deadening where it matters the most.. Disclaimer, I have not finished this yet, so I don't have results, but here is my plan/theory..
Big ADHD/OCD dump incoming.. Sorry in advance..
-My (4) main stereo speakers (6.5" Infinity Kappa) are mounted at the ceiling. The fronts are in the overhead console, and the rear are in some Marine style tower bullet cans. I'm mounting them this high up so that no matter what seats/people/cargo is in the van, the sound should be mostly unobstructed. I may mount a pair in the front doors and quarter panels too eventually for more volume, but there are potential reductions in sound quality when adding too many speakers so we'll cross that bridge later. -I've been driving this van completely bare on the inside for 3 years now and the main source of resonance was actually coming from the roof skin. Over the years, the roof skin has become detached from the support ribs. There was a lot of resonant noise coming from above on the highway. I could use my fist and gently pound on the roof skin at the driver's seat and watch it move at the rear of the van. I don't remember the exact name of the product, but it came from 3M and was a 2 part expanding foam that closely matched the original foam adhesive that holds the ribs to the skin. This made a huge difference. Now that the roof isn't flopping around. On to other things. -Since Dynamat (I'm looking at other brands as well such as Hushmat, but for the sake of simplicity here, I'll refer to it as Dynamat) and similar products are very expensive, and also heavy, I am going to use them sparingly and only in places where they will be most effective. For the front speakers, I will be adding Dynamat to the whole front section of roof skin from the front back to the first roof rib. This area will be dealing with resonance and vibration from the speakers, as well as being a source of wind noise on the highway, especially with the visor that is installed. I may add more to the area around the read speakers as well for good measure. 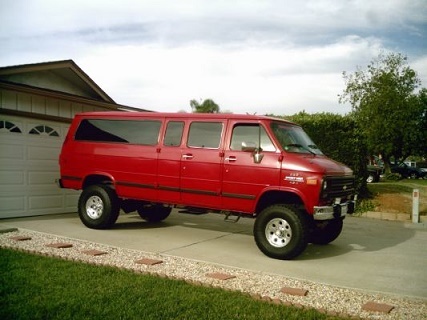 The rest of the body of the van will get conservative applications of Dynamat. maybe a few smaller tiles per roof and wall panel. Per sounddeadeningshowdown.com and a few other sources out there, this type of sound deadening does not need to cover every inch of a panel, "Covering 25% of the surface distributed over the central 50%-75% of the panel". Any more than that supposedly results in diminishing returns.. To save money, product, and weight, I'm going to try this theory out on the rest of the roof and the body walls. I am still up in the air about how I will handle the doors. My doors have a factory looking (maybe ziebart?) type of substance on them and I doubt that dynamat or similar will stick. I'm going to focus on the doors when I cover the interior panels below. -Back to the overhead console.. The metal roof above will have dynamat, but I am going to add a layer of adhesive backed sound deadening foam on top of that as well as the inside of the overhead console around the speakers. While the dynamat should cancel most of the resonance and vibration, I'm hoping that the foam kills the stray sound waves that may bounce around inside of the overhead console. This foam will need to be closed cell, or hydrophobic so that it doesn't get effected by moisture or condensation, or even worse cause rust. I am focusing on this area so much because it is less than 2ft from the driver's and passengers heads and I feel that it will make the most negative impact if neglected. The rear speaker cans will be filled with Polyfill which is common practice on the boats that the speaker cans come on. I am planning on adding subwoofers in a box under a bench on the left wall. The box will be mounted on rubber cushions and there will be extra dynamat in that area for obvious reasons..
-Floor and wheel wells: Unlike some folks, I have decided NOT to apply dynamat, foam, or any other product that could potentially trap water against the metal floor and cause rust. While it's not 100% possible, I am going to try to use as little wood product in the van as possible to avoid moisture/condensation issues and in the long run prevent rust. (More in this later). My floor has a number of holes in it from a previous owner. I am going to either weld or flush-rivet as many of those closed as possible, and then I'll seal up any surface rust with Master Series coating (Look it up, good stuff! ), Lastly, the entire floor, about 12" up the walls, and as far up the firewall as I can reach is going to get lined with Monstaliner. A few reasons for this. First, While I believe I have all of my rain leaks sorted out, during downpours there will still be situations where the floor may get wet from shoes, open doors, etc.. The bedliner should help protect from floor rust even if it gets wet from time to time. On top of that, I'm going to be using either plastic or composite floor instead of plywood since it won't retain moisture like plywood. Then some sort of marine grade floor covering on top of that.. Hoping that all of those layers will quiet down the floor. -Interior upholstered panels. The interior panels will be constructed from FRP plastic shower paneling. You can find this stuff in 4'x8' sheets at Lowes or Menards for around $25/sheet. It's a little pricey, but should work perfectly. It's not going to adsorb moisture and cause rust, it's strong, yet thin enough to be fairly flexible. It has a pebbly texture on one side, and is perfectly smooth on the other side. The smooth side would be perfect for gluing upholstery too. Anyways.. Back to stereo/sound deadening. I'm going to construct a custom interior using these panels for the headliner and the walls The back side of these panels will be covered with Reflectix thermal insulation, and in areas where sound may become an issue, I may also attach some more sound deadening closed cell foam. Not to mention any foam or thick upholstery on the interior side that will also absorb some sound..
-Anyways.. On to the stuff that the thread is actually supposed to be about.. The head unit will be a Kenwood KVT-7012BT. We have the previous version double DIN in a couple of the other cars and we love it. This is the single DIN version with flip up screen. As I mentioned, the main 4 speakers will be 6.5" Infinity Kappas and those will be run via a (currently undecided) amplifier. Probably something in the 4x100 watt range. We'll see. The subs will be on the left wall right behind the driver's seat in a custom box. They are older Infinity Reference 12" subs with a matching vintage 1400 watt Infinity amp. I bought them new about 10 years ago and they continue to be great. Bonus points, I am mounting 2x Polk 6.5" marine speakers in custom enclosures in each side barn door (4x speakers total). These will be on their own amplified channel and will be usable with the stereo, or with the TV that will be mounted to the inside of the right rear quarter panel and swing around to be visible through the barn doors. Since we use the van at the race track a lot, it will be nice to have an external sound system. I'll document this in the build thread as it happens, but I was right in the midst of planning this all out when this thread was posted.. Sorry for the long read. I am in the process of installing my stereo system. I have a Kenwood single DIN head unit; 6 Kicker 6x9 speakers (2 for the front doors and 4 for the back); Kicker 12 inch sub in sealed enclosure; 4 channel and mono Kicker amps. I am going to put in an auxiliary battery for power and use a smart battery isolator. I insulated the front floor and roof with Dynamat-type insulator and used rigid pink foam insulation sheets on the walls. No stereo. Had 'em in the past and never used them. We ride and we talk. And I'd much rather hear what my baby has to say. I feel like Catfish is a better human being then the rest of us now.. I fully intend to have the capability to drown out the misses, the neighbors, the neighbors neighbors, etc lmao. I feel like Catfish is a better human being then the rest of us now..